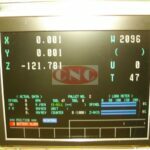 26S14M001 KME Monitor - CNC Electronics Inc.
CNC carry stock of this KME Monitor. CNC M001 replaces the original 26S14M001 manufactured by KME. The 26S14M001 monitor was built under license to Mazak / Yamazaki corporation, utilising Mazatrol (Mitsubishi) control system. Originally fitted on M32, M32 , T32, T32 Mazatrol control systems. New replacements are available from CNC. We have been building these monitors for the last 14 years at CNC. They are completely compatible and only made to replace the original 26S14M001 and work on the Mazak / Mazatrol / Mitsubishi machine tool systems. 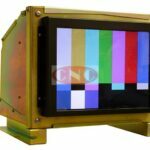 The OEM monitor is a 14″ color crt screen, which our CNC M001 replaces. The cost is $1250.00 USD, which is an outright buy, we do not want, need or require your old monitor. The 26S14M001 replacement monitor comes with a full 24 month / 2 years warranty.